Mobil Equatorial Guinea, Inc. (MEGI), as operator for a joint venture with UMC, began production at Zafiro field, Block B, offshore Equatorial Guinea on Aug. 25, 1996, from subsea wells tied back to the FPSO Zafiro Producer, Fig. 1. By December, eight wells had been fled back to the FPSO and production was approaching the 40,000 bopd targeted for Phase 1 of the development project, Fig. 2. Having also demonstrated the upside potential of the field, Mobil had committed to the Phase 2 development program, intended to raise production to a sustainable 80,000 bopd, and engineering and procurement were well underway. Mobil purchased the FPSO in December from the conversion contractor, Oceaneering International, Inc. Oceaneering continued to operate the FPSO for Mobil under a three- year contract, and took on the additional responsibilities of project manager within an integrated Mobil-led team, for an extensive program of Phase 2 vessel modifications. This construction work would be performed in the field with only minimal interruption to normal production operations. FMC and Coflexip Stena continued in their roles from Phase 1 as principal contractors for provision/installation of additional subsea production facilities. This article describes the modifications that have been made to the Zafiro Producer since its installation, and the fast-track project management methods used to expedite the work. The modifications constitute a construction program of unprecedented scope aboard an operating floating production system. A vital element of the overall program is the procedure that has been developed to ensure operational safety and environmental protection during the construction activities. Other field development activities are taking place concurrently with the FPSO modifications. The in-field modifications to the operating FPSO are part of the phased development plan that Mobil conceived for Zafiro following field discovery in March 1995. To maximize the Zafiro reserves' value, Mobil set a target of first oil a short 18 months from discovery, or August 1996, a schedule which would not allow for full reservoir appraisal and evaluation before project commitment. By adopting a fast-track phased development plan, Mobil was able to pursue the ambitious schedule objective based on reserves proven by late 1995 while accommodating potential upside requirements and managing risk factors. The rationale for this approach and key development plan components are explained in Alexander and Richardson, "Equatorial Guinea Zafiro Field Development - An Overview" (OTC 8425), May 1997. Related papers provide details of Zafiro geology, reservoir evaluation, the subsea production facilities and the FPSO conversion project. The FPSO conversion was performed on a fast-track schedule at a shipyard in Galveston, Texas. There, between early December 1995 and late June 1996, the 268,000-dwt tanker MT Swift, built in 1973, underwent life-extension repairs and refurbishment to meet the requirements of an initial three-year contract. It was equipped with an 80,000-bpd production process system in two identical 40,000-bpd trains and a permanent 12-point spread mooring system. 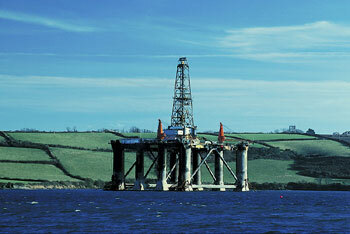 The specs and workscope were based on Zafiro reserves proven by November 1995. The project budget based on these reserves and Mobil's fast-track schedule objective imposed limits to the initial conversion workscope and Phase 1 production targets. These limits ensured that the Phase 1 project would be profitable, based on proven reserves of November 1995. In the event that subsequent drilling, production and reservoir evaluation proved the envisioned upside reserves potential, the FPSO conversion was designed to facilitate the offshore installation of additional equipment that would be required to achieve and maintain plateau production of 80,000 bpd and maximize ultimate recovery. When data from downhole pressure sen- sots demonstrated reservoir continuity following production startup, Mobil commenced engineering and procurement for the Phase 2 development. The success of additional drilling in the greater Zafiro area has further enhanced reserves. The Zafiro Producer thus left Galveston with an 80,000-bpd primary production system occupying a 600-ft length of its portside deck. The system would be limited by wellstream inlet constraints and gas-handling capacity to about 40,000 bpd maximum throughput during Phase 1. The starboard deck was bare. Before heading for West Africa, the FPSO was drydocked in Portugal for remaining tank and hull steel repairs, final inspections and painting. Specification/design of the Zafiro FPSO conversion were based on production of reserves proven as of November 1995 at a plateau rate of 40,000 bpd over a period of 3-5 years without pressure maintenance or secondary recovery. As proven reserves grew following production startup, it became clear that Zafiro was capable of producing at a rate of 80,000 bpd for a considerably longer period and that pressure maintenance would greatly benefit ultimate recovery. The Phase 2 field development, including FPSO modifications, implements this strategy. In addition to the Phase 2 modifications, a program of further life-extension is planned, to upgrade the FPSO for the much longer service life now envisioned. Phase 2 modifications were divided into three stages, 2A, 2B, and 2C (now referred to as the Gas-Lift Upgrade). The work was scheduled over three years, with major module installations occurring in the January-to-March timeframe of 1997, 1998 and 1999. Each round of module installations is preceded by construction activities aboard the FPSO to build support structures and prepare for the heavy lifts. Following installation, the modules are hooked up to related ship's facilities and commissioned for startup. The modules are fabricated at U.S. Gulf Coast facilities and transported to West Africa. To date, all module installations associated with Phases 2A and 2B have been completed, and hookup for 2B is substantially complete. Each of the three stages of the Phase 2 FPSO modifications targeted a specific major objective. Phase 2A increased process throughput capacity to 80,000 bpd from 40,000 bpd by expanding the inlet systems and adding slug catchers. Gas disposal capacity was also substantially increased by installation of a buoy-mounted flare remote from the FPSO. Phase 2B installed equipment for water injection and additional power generation. A 58-man accommodations unit was also installed. The Gas-Lift Upgrade will implement gas lift capabilities from the FPSO in 1999. The original plan also called for gas injection compressors to be installed aboard the FPSO. These have now been shifted to the fixed platform that will be installed at the nearby Jade field in early 2000 as part of the broader field development. The Zafiro Producer will receive and store processed crude oil from Jade through a 10-in. flowline, and will send Zafiro gas to the platform for reinjection through a 6-in. bi-directional line. A single-point-moored offloading buoy will be installed to supplement present tandem offloading operations. FPSO modifications for 1999 are now limited to installation of gas-lift compression and related utility equipment. The magnitude of Phase 2 FPSO modifications is indicated by the module installations, associated expansions and upgrades performed in each stage, as shown below and in Fig. 3.